Home Made Cherry Almond Granola with Chia and Pine Nuts- So Good! I’ve been meaning to try a granola recipe that I found and squirreled away on Pinterest, and now I have a great model to imitate- I used a recipe from Cook’s Illustrated, tweaked the ratios to make a smaller batch, and added chia seeds and pine nuts to come close to the Fit Chick bag o’ goodness. Mix together the first seven ingredients (syrup through the oils). Mix in the oats, almonds, pine nuts and chia seeds. Press into a 13″ x 18″ half sheet baking pan (or a cookie sheet) and bake at 325 degrees for 40 minutes. 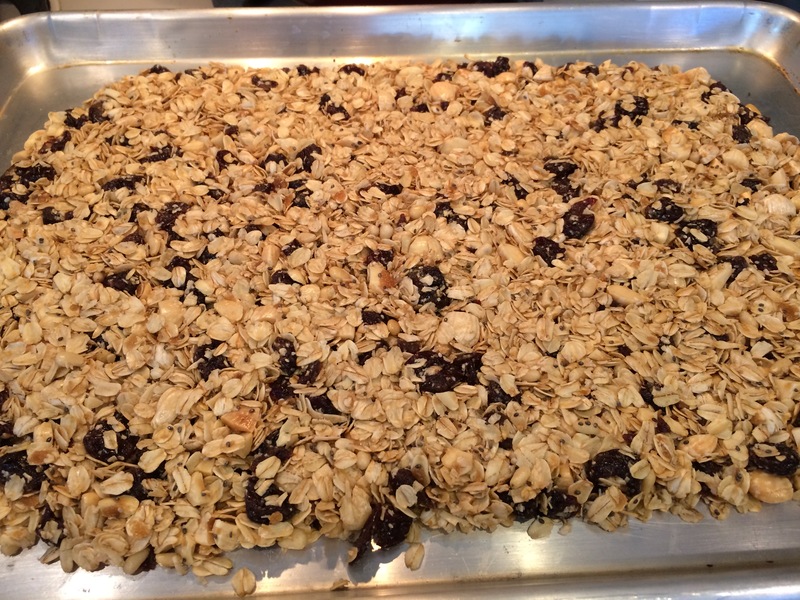 Watch that the granola doesn’t get too browned! Let cool slightly, break into chunks, mix in the cup of dried cherries and try to keep yourself from eating it all in one sitting. Patted into pan… I’d leave the cherries out until after it has baked, next time. This was another “Holy Yum” recipe. If I were to rank it, it would be worthy of an 11 out of 10, à la Spinal Tap. 11/18/17 Update: I’ve continued to make and share this awesome recipe, and started adding 1/2 teaspoon of ground cardamom. Wow, is that a great addition! Another change I’ve made in the recipe is to increase the coconut and canola oil from 1 1/2 tablespoon, each, to two tablespoons, each. I think it needed a bit more of the oil to help keep everything together. 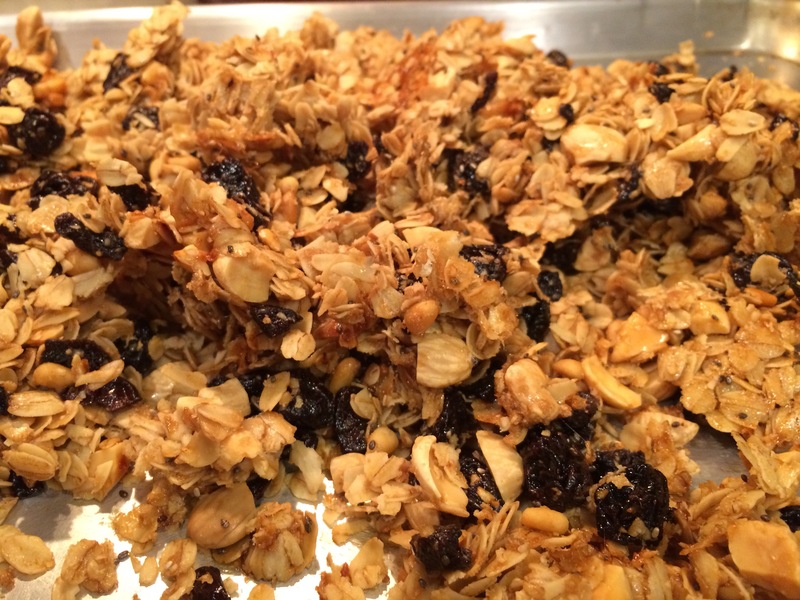 And I also realize now that when you bake dried fruit in a granola, the fruit turns into little tough rocks. That’s not good. I’ve learned to mix the fruit in at the end! Next Next post: Hey, Vinnie! What’s Today’s Special?